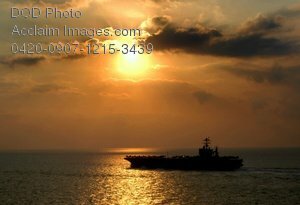 Description: Free, public domain image: Aircraft Carrier USS Harry S. Truman in the Straits of Gibraltar at Sunset. ATLANTIC (Nov. 12, 2007) The aircraft carrier USS Harry S. Truman (CVN 75) transits through the straits of Gibraltar. Truman is en route to the Central Command Area of Responsibility to support maritime security operations in the region. U.S. Navy photo by Mass Communication Specialist Seaman Justin Lee Losack.